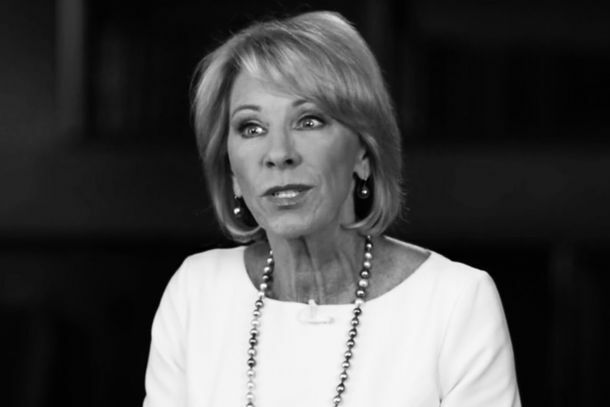 Memo Refutes Betsy DeVos’s Claim She Couldn’t Ban Schools From Buying GunsAn Education Department internal memo proves Betsy DeVos could have blocked schools from using federal funds to buy firearms, contrary to her claims. 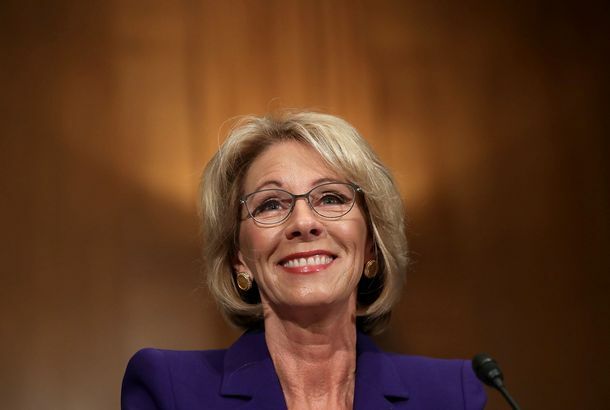 Betsy DeVos Wants to Eliminate All Federal Funding for the Special OlympicsFor the third year in a row, DeVos hopes to cut federal funding for the program — a small financial gesture, but one that shows where priorities lie. 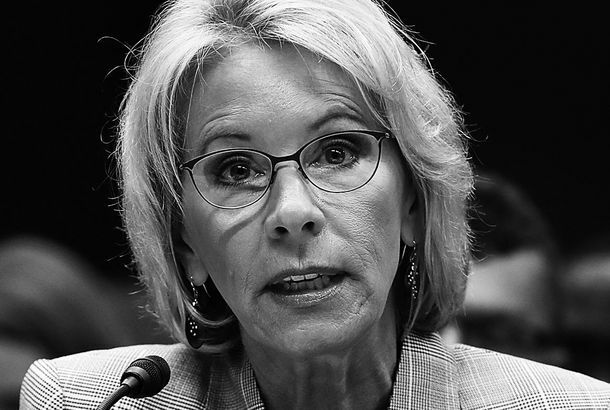 Among Other Things, Federal Subsidies to Defraud Students Are ExpensiveBetsy DeVos thinks for-profit colleges as well as K-12 private schools deserve federal subsidies without accountability. 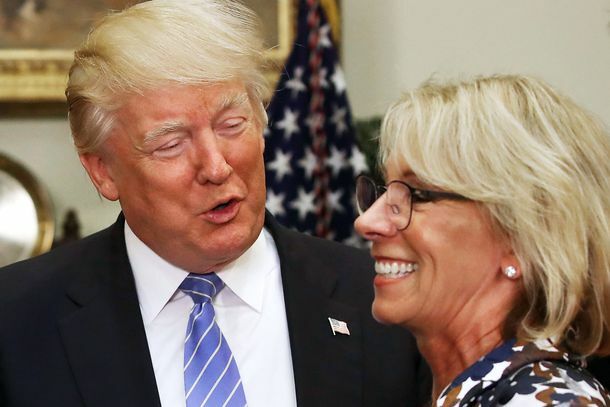 Trump Invites For-Profit Colleges to Exploit StudentsBetsy DeVos thinks the federal government should help failing colleges rip off students. 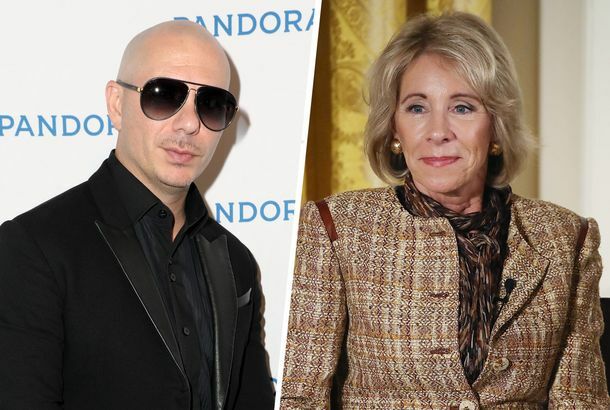 Betsy DeVos Gets Brutally Owned After Painful 60 Minutes InterviewThe best responses to the Education secretary’s excruciating interview. 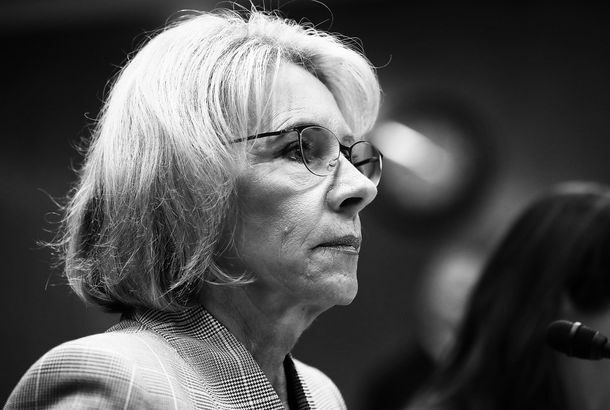 Here’s How Much Betsy DeVos’s ‘Extremely Unusual’ Security Detail Could CostShe has an around-the-clock team of U.S. marshals. 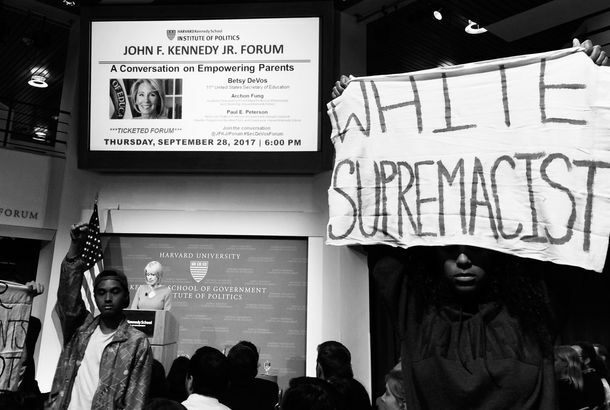 Silent Protesters Just Confronted Betsy DeVos at HarvardThey held up signs opposing white supremacy and her rollback of Obama-era campus sexual assault guidelines. 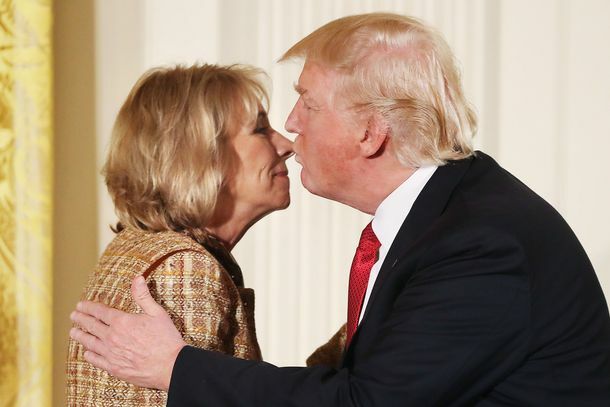 Trump, DeVos, and the Creation of an American OligarchyTrump was open about his racism, authoritarianism, and admiration for Putin. His great lie was that he would drain the swamp. Betsy DeVos and Ivanka Trump Totally Left This Little Girl HangingShe just wanted to ask a question. 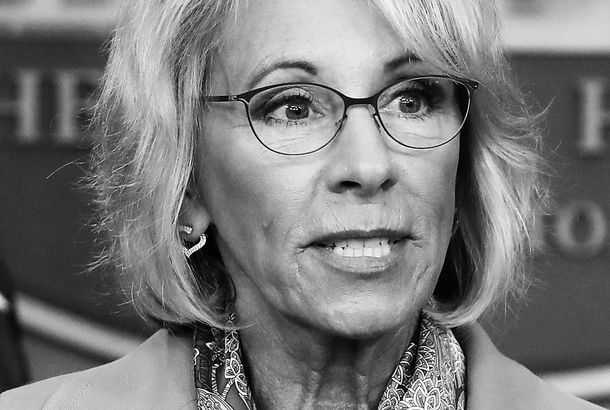 Betsy DeVos Knew How to Wield Power in Michigan. 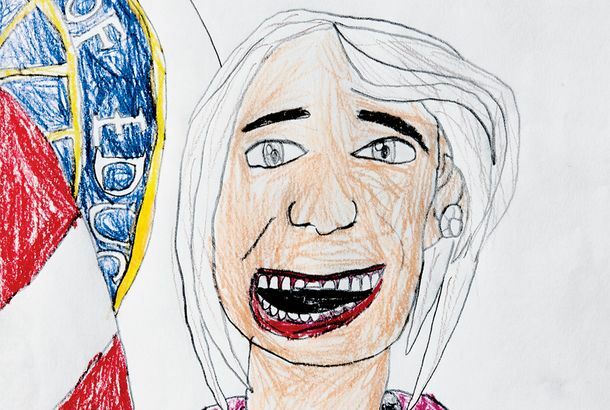 It’s Not Working in D.C.Who is she? And how did she get to be head of our schools? 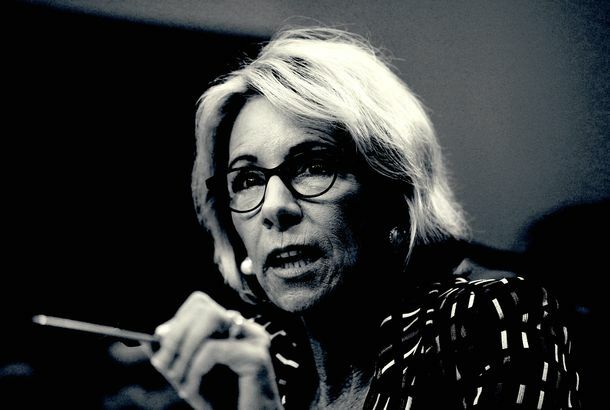 Betsy DeVos Cites Jim Crow–Era College System As Model of ‘School Choice’The Education secretary explains that historically black colleges prove that publicly subsidizing unregulated private schools is a good idea. 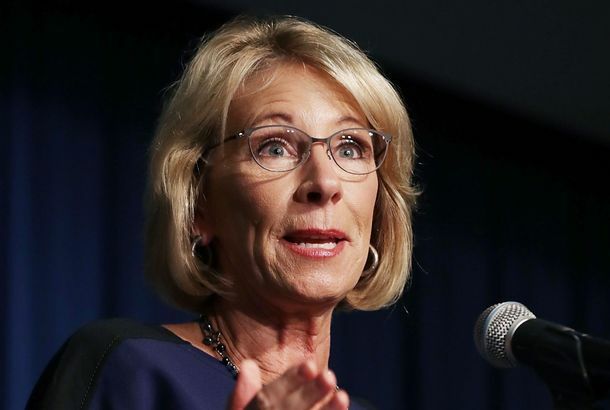 The Trump Administration Can’t Agree on Treatment of Transgender StudentsSecretary of Education Betsy DeVos is hesitant to rescind Obama’s guidelines. 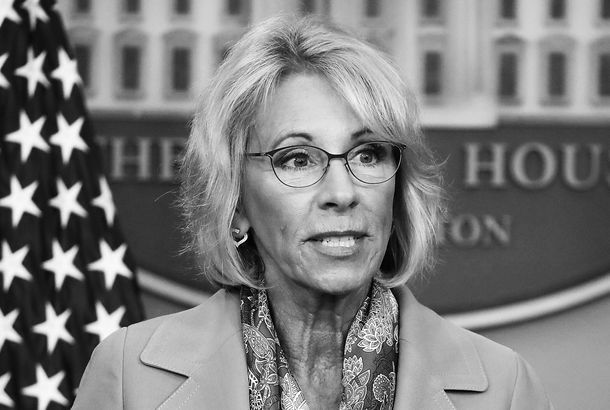 Why Was Betsy DeVos the One Trump Nominee Who Provoked Opposition?Democrats can muster enormous political energy against Trump. But can they channel it effectively?